Text/ile - "A white plastic box inscribed with a colorful legend, anonymously medical or scientific in origin, opens to reveal a woven textile, folded upon itself, black and white threads that merge into a shifting pattern of gray rectangles. 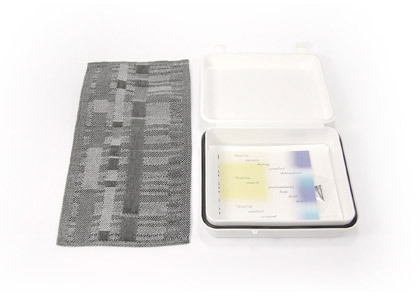 . .
For this project, scientific diagrams of chromosomes–8 of the 23 found in human cells–have been reduced to grayscale patterns composed of black and white thread and woven on a Jacquard Loom into textiles." Statement about Text/ile: The work I completed for this project immediately reminded me of Anni Albers work, especially when seen in color as depicted in my graphic digital image that goes to the loom for weaving. Weaving fascinates me as a mechanical process because it is one of the most overlooked processes, but without which we would not have sheets, towels, clothes, etc. This particular project allowed me the opportunity to examine the production mill using Jacquard looms which allow the weaver to individually control each thread of the warp. A traditional floor loom only allows weavers to control batches of threads in repeats from 2-36 threads at a time. So, a weaver has to have the ability to think in repeat design that produces a functional textile which usually means not having too many “floats” or long threads that are not tied down and can catch on objects within range thereby destroying the textile. Other factors come into play with weave structures too, such as how much color is seen from the warp and the weft which depends upon the density of the cloth (or how many ends per inch are in the warp and weft). Working in a production mill allowed me the opportunity to focus mostly on the design rather than the production. It also gave me a grave understanding of our current state of affairs in the textile industry in the U.S. which is diminishing rapidly as mills are relocating overseas to take advantage of cheaper labor. While this means that our clothes are as cheap as ever, it also means many skilled workers are out of jobs while also increasing our carbon imprint as we will now have to ship the products back to the U.S. for consumption. Maggie Leininger is an artist based out of Oak Park, IL who is interested in exploring visual relationships between microscopic structures and social systems by deconstructing/reconstructing patterns through weaving. Leininger attended the School of the Art Institute for her undergraduate degree and Arizona State University for her master’s degree. She currently teaches at Roosevelt University, Snow City Arts and other local non-profits agencies in Chicago, IL. In addition to an active studio and teaching career, she also enjoys spending time with her three children, riding her two horses and running alongside her husband as he trains for marathons and triathelons.